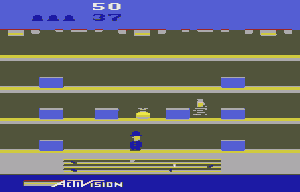 Paying homage to those great silent film classics you don’t see on television any more you take control of Officer Kelly, who through the course of this game tries his best to track down Harry Hooligan and stop him escaping the department store you are protecting. Along the way you’ll have to avoid being hit by toy planes, bouncy red balls and shopping trolleys, whilst jumping over radios. You also have the use of a lift between floors to help you catch Harry, but these run in sequence and sometimes it’s just best to run after him on foot. Stop him escaping and then it’s on to the next level, where things get progressively harder and faster each time. 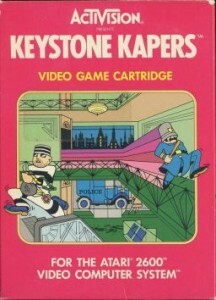 Keystone Kapers is one of the better looking games on the Atari 2600, with colourful graphics, well drawn sprites and good animations. The game moves very quickly with the difficulty level set such that progression is easy, so when you get to the harder levels you know what lies in wait. There is no annoying tune either, just some basic spot effects. It’s hard to find fault with this game at all really as it is playable from the moment you pick it up. You’ll want to keep trying to beat that high score so it is something you will definitely come back to. This is a very impressive package and one that shows the Atari 2600 off to the best of its abilities. The fact it is still fondly remembered today goes to show how good it was at the time. The sneaky Red Baron has been up to no good. He has stolen valuable supplies from the Allies in his attempt to help the Germans win the war. 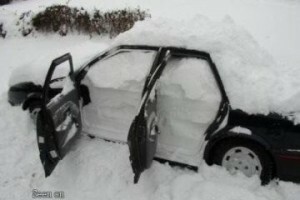 So, who do you call for in a situation like this ? 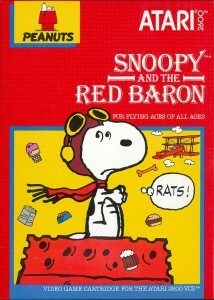 Why none other than Snoopy, the World War One Flying Ace. 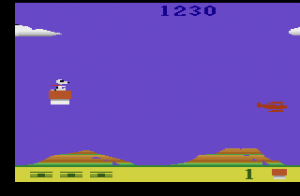 You will battle the Baron in aerial combat, shooting his planes down and catching the supplies he drops out of his plane. Be warned though, as sometimes he’ll drop a skull and crossbones causing you to lose all the supplies you have collected. Shoot the Baron down a number of times in the level before moving on to the nest, but be on your guard as he will fire back and shoot you down ! Now it might seem like I have a thing for Snoopy games, I was playing another on the Gameboy this week that may or may not become an entry in the near future, but one thing I can’t deny is that unlike some Snoopy based games this was actually a lot of fun. 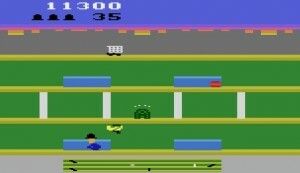 By 1984 standards this game isn’t a lot to look at, but that’s quite unfair. 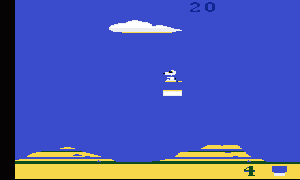 The Snoopy sprite looks as good as any main character in an Atari 2600 game and, while the rest of the game looks suspiciously like an extended version of the aircraft sections from Combat, they do fit the game well. Add in functional sound effects, some pretty good tunes and an instant hookability to keep playing and you have a pretty impressive package. Snoopy & The Red Baron may be simple looking, simple to play and quite easy to master once you get the hang of things, but it’s all wrapped up in a top notch package that will have you chasing The Hun back across Europe to where they belong. Print article This entry was posted by RetroBear on February 5, 2012 at 9:45 pm, and is filed under Retro Reviews. Follow any responses to this post through RSS 2.0. Both comments and pings are currently closed.